This November, the princesses from Arendelle and their little snowman friend will return to theaters in a new animated short playing in front of Pixar’s Coco. Olaf’s Frozen Adventure will follow the quirky beach-loving snowman as he helps his friends Elsa and Anna celebrate the holiday season in Arendelle. Frozen has been such a smash success for Disney that it’s considered its own brand within the Disney Princesses world, and with the release of Olaf’s Frozen Adventure in November, Hasbro intends to make sure your kids have plenty of newly costumed Elsas, Annas, Olafs, and Kristoffs. There wasn’t much new to ogle at the large Disney booth at HasCon, as most of the princesses are out and about already. The breadth and scope of that line from Hasbro, which is just about one year deep into its deal with Disney, is impressive already. I’m sure you don’t need me to tell you considering how often you’ve probably roamed the Disney toy aisles at your local retailers. One corner of the Disney world actually did feature some brand-new items, and they were tied to the real moneymaker for the brand, Frozen. With the upcoming release of Olaf’s Frozen Adventure, you had better believe Disney and Hasbro intend to capitalize on the chance to offer new dolls for Elsa, Anna and the rest of the gang. In addition to a four-pack of figures collecting the main cast, sans Sven, Elsa will get a new singing doll, and Olaf will get a larger interactive figure that's all about breakfast. We couldn’t hear the new song from the short on the Elsa doll — gotta keep it secret until November — but her dress was a slightly modified version of the one included in the four-pack. Aside from the singing element, they were virtually the same. While Frozen’s newest delights were the focal point of the Disney booth, one of Hasbro’s newer projects caught our eye. 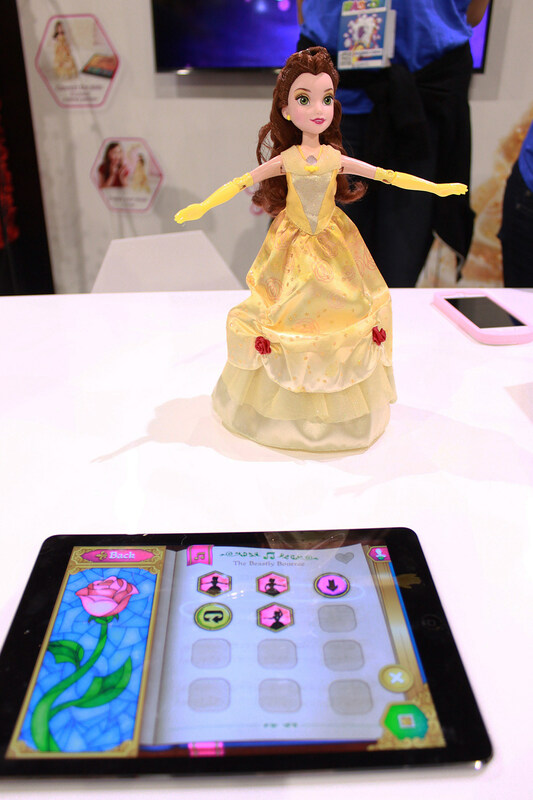 Revealed at Toy Fair back in February, Dance Code Belle was out in full at HasCon, giving fans and kids a chance to test out the app-enabled dancing princess. Based on her look from the iconic ballroom scene in Beauty and the Beast, Dance Code Belle works with an app to allow kids the chance to program her moves. She knows over 100 different phrases and can sing seven different songs while gracefully gliding across tabletops. The app is intuitive and easy to grasp, with several different levels of skill offered depending on how much customization you want in how Belle dances. Some instances have a set path she’ll follow, where you just input the key moves like a spin or arm movements, and others allow you a bit more freedom to create her path and every flourish along the way. The app isn’t 100 percent necessary, as Belle can do almost everything on her own, but you lose out on the ability to feel like you’re really coding her movements. It’s a smart way to keep kids engaged, and I hope this is only the start of more clever and creative interactive toys from Hasbro and Disney. The Olaf’s Frozen Adventure dolls and figures will be out this holiday season wherever Disney toys are sold. The Dance Code Belle is an Amazon exclusive, and will be out on November 1 for $100.